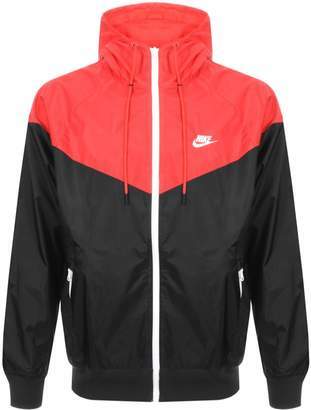 Nike Windrunner Jacket In Black And Red, Loose Fit. A large drawstring hood with a front peak and a mesh lining and full front zip opening with a contrasting white Nike logo zipper. Stretch ribbed design to the cuffs of the long sleeves and waistband in black and two slanted zip entry pockets on the waist. Colour block design with a red chest, black sleeves and a black waist. The signature Nike Swoosh logo is embroidered on the left of the chest in white. Ventilation flap on the reverse and a mesh body lining. Body 100% Nylon and Mesh 100% Polyester. Brand New Sportswear Collection Of Nike Jackets and Zip Tops Live Online.